You are here: Home / Business / Can You Really Start a Business With Little to No Money? Most people who want to start a business focus too much on capital than the business idea itself. Sadly, most of these budding entrepreneurs get stopped on their entrepreneurial path to success before they even get started because of the sheer thought of not having enough money to start their business. Option # 1. You can join the millions of people who quit their entrepreneurial dreams because they didn’t have the money to start a business. Option #2. Be stubborn and stupid enough to go against the norm and turn a deaf ear to all naysayers who tells you that you can’t start a business with no money. You Can’t Start a Business with No Money! I’ve always been entrepreneurial ever since I can remember but my poor parents have always advised me against starting a business thinking that they themselves didn’t have the money to start one. When I was younger, my mom always believed that you can’t start a business if you don’t have money and that people who starts businesses already had the money. At the back of my head, however, I always thought how it was possible for people with very humble backgrounds start businesses with little to no money. Growing up in a traditional Asian family; I’ve always been trained to respect elders and to do as they say so I’ve developed a natural meek and obedient personality but I realized that sometimes we have to stand up and erase all our programmings in order to get ahead in life. When your parents or other people in your circle tells you that you can’t start a business with little to no money; keep in mind that they are telling you this because of their own limiting beliefs. Now if you grew up to parents who have worked as employees their whole life, this programming may have inculcated in your brain since you were a kid and I kid you not; reprogramming your brain to believe otherwise is very hard because this requires a change of reality. Reading articles like this is the first step because it makes you aware that you are not alone in overcoming this belief. Though it would be easier to start a business when you already have the money; keep in mind that those who have started businesses with no money before you were once in situations like yours or maybe even worse. If my parents knew better, I would have started in business when I was in my early twenties and would have experienced financial and business success earlier in my life – but they didn’t and they only knew what they did… and that is: “You need money to start a business”. Five years ago, I found myself in a new country with no job, no money and a young family to raise. Having been let go at a job with same day notice, I knew for a fact that getting another job wasn’t for me but I needed to do something to support my family so I started looking at different business and career opportunities. Working for someone else as an employee no longer had the appeal it once had after being let go from a job because I realized that the companies we’re going to work could only care less of the kind of future we want to build. And when you have a family to support you start thinking of ideas… ideas crazy enough that could just turn your life around. One of the first financial books I’ve ever read was Rich Dad Poor Dad. I believe that I grew up in the “Poor Dad setting”; the only difference is that I had both of my parents having the “Poor Dad mentality” with my mom having the most influence as she was authoritarian. If you haven’t read the book, I suggest that you go pick a copy and read. Though considered a classic, most entrepreneurs admit to having their entrepreneurial flair ignited by this book. One of the best things I’ve learned from the book is the fact that “money is just an idea”. I didn’t understand the concept right away with my young and underdeveloped entrepreneurial mind (I read the book in early 2000) but I understand it fully now. If you have a great business idea that brings true value to the marketplace, you will be paid accordingly. Launching that idea into a business venture may or may not require funding. Sometimes monetary capitalization may be replaced by creativity; it’s just a matter of changing one’s reality. What I’m trying to say here is… if you have an idea, you will have the money. But… and that’s a big BUT; you have to commit to that idea and drive it hard to succeed! Your idea or business model is more important than money. Starting a business with no money doesn’t mean that you absolutely have no money to support yourself and family. You need some sort of cash flow to cover your living expenses at the least while you’re starting your business. If you’re young, single and you live with your parents; you have a little head-start compared to people with young kids who are dependent on them for financial support but even when you’re at a stage where you have a family to support, you can still start a business with no money. Just make sure that you have some sort of income to support your family. If you’re working at a job and you want to start a business; stay at it or get another one no matter how tired you think you are of the 9 to 5. If you’re not employed, get a job first not unless if you have some sort of income coming in without you having to physically report at work. In Canada, for example, employees who have served at least 700 hours at a job are entitled to employment insurance which gives employees income supplement if they lose their jobs to no fault of theirs. This type of benefit is a powerful leverage that can help you start your own business. Once you have some sort of income coming in to support yourself and family – start a business. Starting a business doesn’t have to be grandeur… just start! 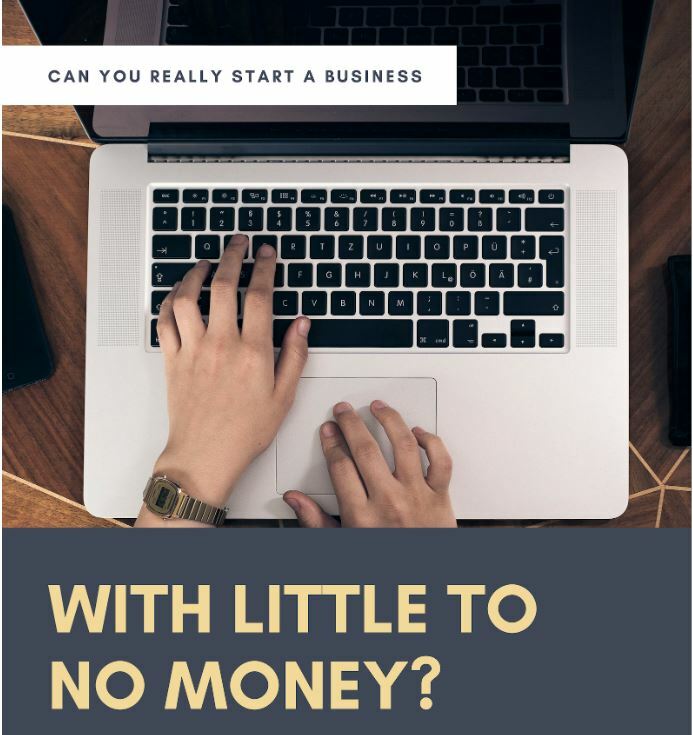 Starting small lets you start a business with little to no money and there are a lot of different opportunities around you if you just open up your mind to possibilities. The best businesses to start with little to no money are service-based and product sales businesses, especially ones that you could get started with no inventories. I myself started as an independent contractor in the financial services industry, grew my team into an agency of my own and have been operating the same in the last three years. If you’re in Canada, I can help you get started in the financial services business. Roughly 12 year ago when I decided I no longer wanted to work in the accounting field. I decided to work in the pharmaceutical industry to learn how to sell and boy it was tough! Coming from an accounting background, I’ve learned that I was the worse candidate for a sales position and I did it anyway for roughly 3 years. I was so bad it at that I got fired 6 months in from the first pharmaceutical company that accepted me to be one of their medical sales representative. Again, I was so stubborn to quit that I applied for another sales position in a related industry; that time, I applied for a medical supplies distribution company that imports Japanese and Canadian medical supplies into the Philippines. I lasted around two and a half years with that company and I was still bad at it. I did managed to hit my sales quotas here and there but really, nothing sort of convincing. It’s odd to believe that someone who’s so bad at sales a decade ago is currently training people how to sell and build successful financial services businesses. I believe that’s because I simply pushed myself to learn how to sell no matter how bad I was at it. So why do you need to learn how to sell? Selling is the most important skill a business owner should have. No, I don’t mean the snake oil type; I’m referring to ethical selling here which is an entire article in itself. You know what, anyone can sell but very few salespeople actually focuses on delivering true value to their clients and If you focused on giving people what they want; you’ll be closing deals anytime of the day! Hope you found some valuable inputs in this article on how you can start a business with no money. If you found this article helpful, please don’t hesitate to share this to others by clicking the any of the social media links below. If you have any questions or concerns, you can comment below or drop me a line by using the contact form and I will try to respond to you asap or write an article that addresses your concern(s) if it could also help others. In the meantime, if you’re not sure which business you can start with little to no money; here’s a list of freelance businesses you can start from home.